Last post we (the Royal We, always, please) looked at some salmon mass harvesting technology from north central BC. But what do you do with all those fish? They need to be processed into a stable form for storage, and then cached somewhere, somehow. While there are lots of ways to skin a coho, I’m going to focus on some extraordinary photos from the Yale area on the lower Fraser River, late 1860s.The above shows four large box-like structures, identified as a salmon cache, high in a tree presumably to help protect them from scavengers. I say “presumably” because there may be another reason to do so. In this picture of what is clearly the same tree but at a different time (earlier, note low dead branches are gone in the first pic), the boxes are safe and dry above the flooding Fraser. Whether this was a deliberate design feature is hard to know (why not just build uphill?) but then I usually work on the assumption that First Nations folks know exactly what they are doing, and it is on us to learn the lessons. For example, we can see that there is use of ropes as well as slender branches or poles to help hold the boxes in place, and the lower boxes at least are resting on planks. The boxes themselves are made of planks in a manner reminiscent of Coast Salish houses, and the impression given is much like the practice of tree burial. You might be wondering how I can see those details, and actually it is because there is a third, apparently independent picture of the same tree, only taken at least a year earlier I would think, judging by the condition of the upper tree. Luckily (or not: it’s a human decision) the Vancouver Archives picture is available online at a much higher resolution than the BC Archives versions. In this image, you can see the tree is in better shape with needles on its upper branches, is (obviously) growing on land, and if you zoom in you can see more detail of how the boxes are attached. (And yes, it is the same tree, note the distinctive lower branch that sticks out to the left in this picture, present in all pictures). Tree caches are a thing, but I don’t think I’ve seen too many pictures of them over the years. Considering archaeologists have focused a lot of thought on the various means of delayed consumption of mass harvested salmon as a prime mover for social change on the NW Coast (maybe too much thought, actually) then there seems to be a certain lack of attention paid not only to fish weirs, but also to the storage mechanisms – it can’t have been easy to keep even dried and smoked salmon edible across cold, wet winters. 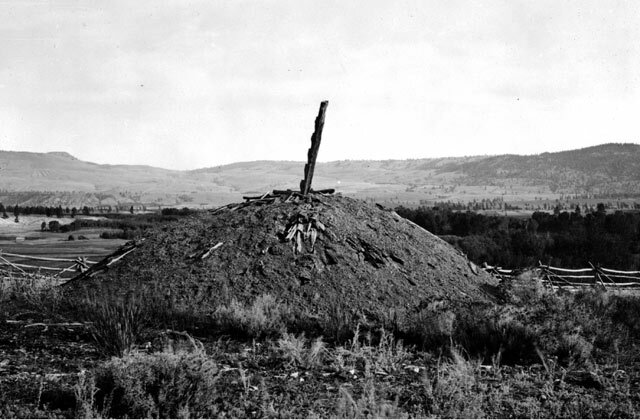 I know of at least one place in the interior where there is a double row of cache pits, 10 I think, of which 9 are “pits” represented ground caches that were consumed, and one is a mound, presumably a cache pit that still has its contents. That’s a cool spot for a future project to cache in your memory, perhaps. Now, all this being said, the above pictures led me to a contemporaneous picture from Yale, showing storage sheds on slightly raised platforms. You can see more details on the house-like structure of these sheds. But as is often the case, it’s the incidentals which make the picture. On the left, there is a dipnet – look how big that is! You’d need some buff shoulders to be waggling that into Fraser River whirlpools and pulling out kilos of salmon at a time. And on the right, that enigmatic, really long item (ca. 7 metres) which goes almost out of frame. At the top it is divided into two poles, at the bottom only one. It appears to be finely made. I don’t think this is a dipnet, though I might be wrong. With its size, slenderness, fine manufacture, and double end – I think this might be a sturgeon spear, used in a manner of probing the bottom of the river and then stabbing when a sturgeon is felt on the tip of the spear (one of the only archaeological papers on this phenomenon is found here (PDF downloads directly), by Friends of the Blog Gray, Wigen and McLaren, see also Sylvia Albright PDF online for more how-to). 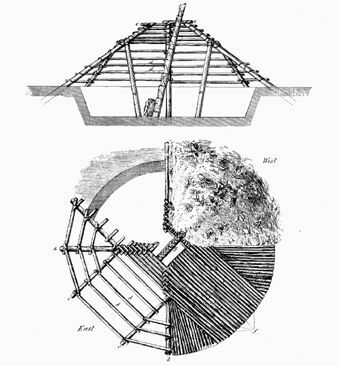 Another detail in the picture above is the ladder formed by notching logs — you see drawings of these in reconstructions of Pit Houses from the interior but it’s less common to see a picture of the actual thing. Anyway, catching the fish is just the first (and maybe the easiest) step in the long process of creating a reliable, low-risk winter food store, and the resultant caches may have inherited both subsistence importance and symbolic cachet, wherever fish could be harvested en masse. coax me in the hollow ash. bear me pink by winter-fat. sleep until willows sponge the sun. promise you will cache me. This entry was posted in Archaeology, First Nations, history, Lower Mainland, Northwest Interior, Technology and tagged caches, fish, fishing, salmon, storage, tree caches, Yale. Bookmark the permalink. This is a very distinct shift away from what usually passes as historical research. this is comparative ,not authority ,but comparison, You see ,you are advised what someone else sees ,and you look again. This is a fine and respected way to understand. Keep it up, its out there ,if you can just see it more clearly. Liked your poem. Japanese influence via coastal migration route?